Arthur John Reaume was a Canadian politician. 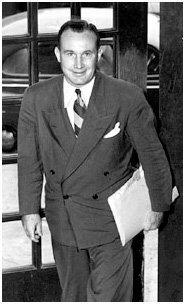 Born November 30, 1906 in Sandwich, Ontario, Reaume is best known as having been mayor of Windsor from 1941 to 1954. He was also a liberal member of the legislature for Essex North for 16 years. Reaume passed away on December 13, 1981 in Toronto, Ontario. His political career began in 1930 at the age of 24 when he was elected as a council member for the town of Sandwich. Reaume became mayor of Sandwich by 1933. In 1939, David Croll, the mayor of Windsor at the time, was called to war, and Reaume took a position as acting mayor of the city. He succeeded Croll as mayor in 1941. During the election at the end of 1950, Reaume narrowly escaped defeat by Tom Brophy as mayor of Windsor, winning by a margin of 16 votes. Reaume remained as the mayor of Windsor until 1954, and he continued his career as an MPP until 1967. Retiring in Toronto, Reaume acted as the chairman for the Unemployment Insurance Commission Review Board until three months before his death in 1981. Reaume is well-known for his emphasis on protecting worker rights. Reaume, who focused on providing inexpensive housing to workers during World War II, supported the construction of over 2000 housing units for this purpose. In addition, he worked with City Council during the Ford Strike of 1945, ensuring that the families of those who were striking received adequate support. Reaume’s influence as a mayor of Windsor is also evidenced by the Arthur J. Reaume Manor, an apartment building in Windsor that is named in his honour. Brode, Pat. (2003). The Eight Day Mayor. Walkerville Times, Issue 39. Legislative Assembly of Ontario. (n.d.). Arthur John Réaume, MPP. Tupling, D. M. (1996). Chronology of Windsor Mayors. Windsor, Ont. : [unpublished].